Mixed methods research involves collecting, analyzing, and integrating (mixing) quantitative and qualitative research (and data) in a single study or longitudinal program of inquiry (Creswell, 2003). In participatory mapping (PPGIS/PGIS/VGI), mixed methods can involve different data collection methods (e.g., qualitative interviews vs. quantitative surveys), sampling designs (e.g., random households vs. volunteers), spatial technology (e.g., hardcopy maps vs. digital maps), or the use of different geometric attributes for mapping (e.g., points vs. polygons). Assessing the validity of mixed methods PPGIS/PGIS research is complex because not only are qualitative and quantitative non-spatial concepts/variables compared for similarity (triangulation), but spatial variables as well. Between 2013-2015, an Australian research team at Murdoch University led by Professor Sue Moore conducted a large mixed-methods participatory mapping study. 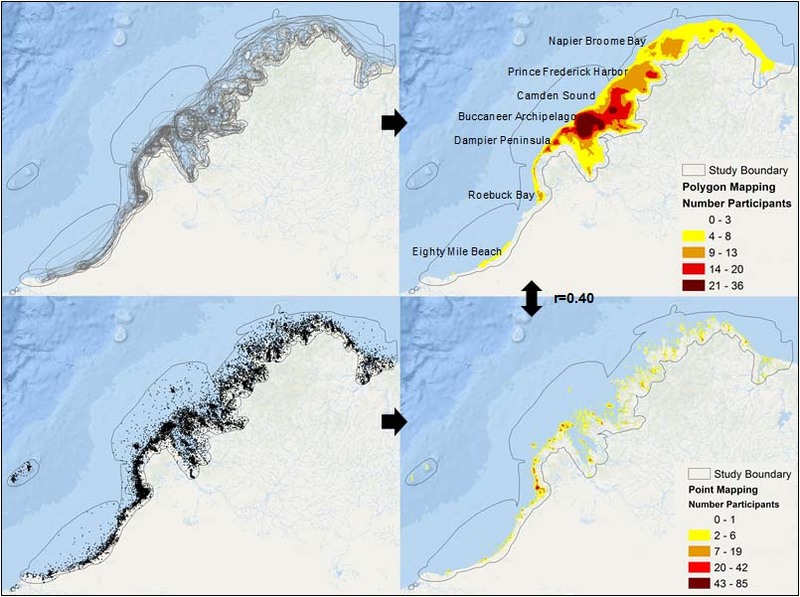 The focus of the study was coastal and marine planning in the remote Kimberley Region of Western Australia. Qualitative interviews were conducted with 232 people from various stakeholder interests (e.g., tourism, oil/gas, fisheries) who were asked to map important places in the region using hardcopy maps and pens to circle these places, and then describe the place values and features associated with those mapped polygon areas. The qualitative responses of interviewees were coded into a list of place values and then linked to the polygons. A polygon could have more than one place value. The interviews generated 986 place locations (polygons) for spatial analysis. A report of of the qualitative interview and mapping process can be downloaded here. Following this qualitative research phase, a quantitative, internet-based PPGIS survey was implemented where stakeholders, households, and volunteers (n=763) were asked to visit the website to map the location of place values using point markers. Participants mapped a total of 15,823 point locations representing place values in the study area. Figure 1. Three members of the Murdoch University research team: Sue Moore (far left), Jennifer Strickland-Munro (second from left), and Halina Kobryn (second from right). 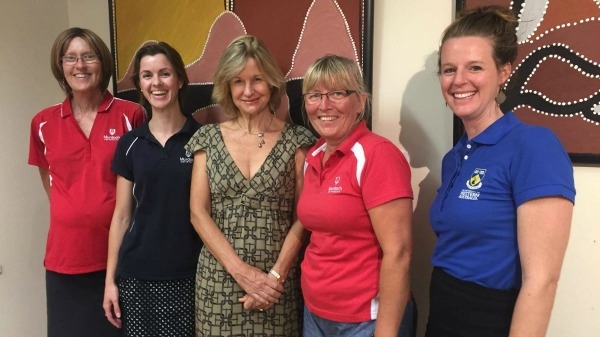 Also pictured is Alaya Spencer-Cotton (far right), a researcher from the University of Western Australia, and Kandy Curran, an organizer of an event that provides for scientific research to be presented to communities in the Kimberley Region. The study found a high degree of similarity in the frequency of place values identified by interviewees and the place values mapped by internet particpants. This is called concurrent validity. The two methods identified similar place values as most important in the region (non-spatial). However, in mixed methods PPGIS/PGIS, attributes/variables also have a spatial dimension that requires comparison. This is the concept of convergent validity. For example, are the scenic values mapped by interviewees the same as the scenic values mapped by internet participants in the same spatial location? The spatial data from the qualitative interviews were analyzed with the spatial data from the internet-based PPGIS survey to determine whether the two different mapping methods produced similar spatial results. The image below shows the qualitative interview and quantitative survey mapping results for the region. The correlation between the number of participants identifying values in the same spatial location in the study region between the two mapping methods was r=0.40. This means there was moderate spatial convergence (overlap) in the places that interviewees and internet particpants thought were important. The degree of spatial overlap between the two methods was highly variable depending on the specific place value mapped, with scenic, recreational fishing, tourism, biodiversity, and Aboriginal culture values having the highest degree of spatial overlap, and the values of existence, therapeutic, and commercial fishing values having the least spatial overlap. Figure 2. Input from qualitative interview mapping (top left), internet PPGIS survey (bottom left) and participant mapping "hotspots" on the right. The spatial correlation was a modest r=0.40. A forthcoming journal article (under review) provides detailed results and a discussion of using mixed methods in PPGIS/PGIS. For more information about the study, contact Greg Brown.